Ahmad, Farah and Mohamad drew their first breaths in their Syrian parents' promised land of Europe — or at least on the edge of it. Greece lies at the wrong end of the continent from where the families wanted to land, separated from the prosperous heartland by an array of high fences, razor wire and border checks. So for now, while their parents wait for the slow wheels of bureaucracy to turn, the infants are learning to smile, turn over and sit up in a refugee camp some 70 kilometers (43 miles) north of Athens. If they're lucky, they'll be resettled in another European Union country by the time they are walking sometime next year. Hundreds of women who were pregnant when they squeezed into flimsy smugglers' boats for the terrifying — and sometimes fatal — sea crossing from Turkey to the eastern Aegean Sea islands are among the 60,000 refugees and other migrants stranded in Greece. One baby, the youngest of six children, even was named Ritsona, after the camp where she was born with severe disabilities on March 31. The hastily erected Ritsona camp is the same one where Mohamad, Ahmad and Farah stay. It houses an estimated 570 people in roughly 15-square-meter (160-square-foot) canvas tents that have been reinforced against the rain and sun with improvised tarps. Rows of prefabricated homes equipped with bathrooms and kitchens stand unoccupied, awaiting final adjustments before the refugees can move in. Meanwhile, the migrants do what they can to create homes. Women bake in makeshift mud ovens. Vegetables and sweet-scented basil grow in small gardens. Neighbors gather on the benches of improvised patios, drinking endless cups of tea or coffee. But for mothers with newborns, the need to nest and the awareness of all that's lacking are especially strong. "This life is very difficult, but in Syria (it's) also difficult," Hanan Halawa, 39, a mother of four children ages 12 to four months, said. Her youngest, Ahmad, was born June 10 in a hospital in the nearby town of Halkida. Halawa and her husband, Yousef, a once-prosperous dairy manufacturer from Idlib, crossed with their three older children from Izmir in Turkey to Chios island, the adults paying smugglers 700 euros each and 350 euros for every child. "I want for my children, not for this baby only but for all my children, a safe place, good education, only," she said, cradling Ahmad. "That's what we want." 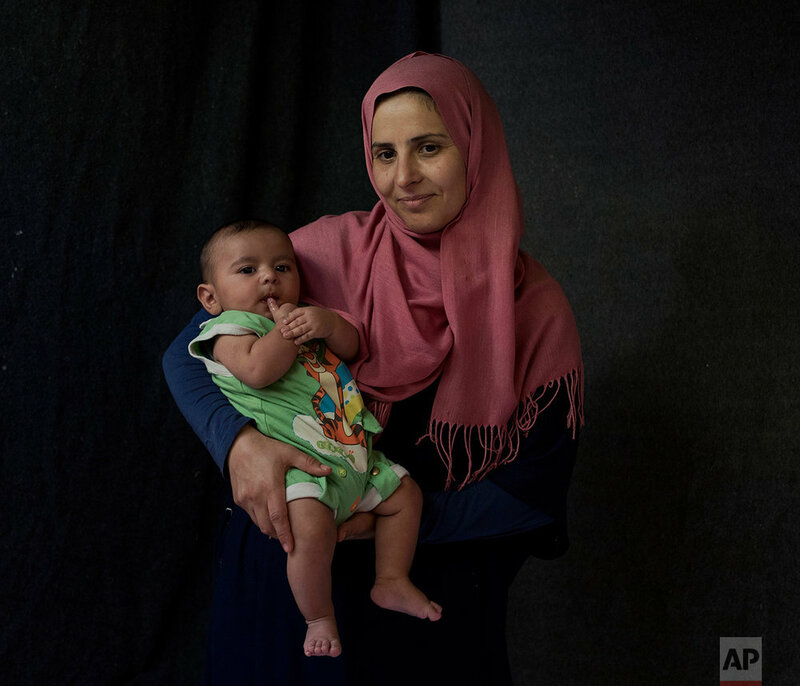 Her neighbor, Hala Baroud, 28, was 4 ½ months pregnant when she made the sea crossing from Turkey to the nearby island of Lesbos, with her husband and their 5-year-old son. They were evicted from Dubai in late 2015 and had nowhere to return to in their native Syria. "I hope for my baby a good life, a happy life, and to live in good places," she said, holding her weeks-old daughter Farah. "I hope I can give her everything. I hope when she grows up, her studies and education, it will be good. That's like all mothers. I hope nothing will be missing from her life." Rima Al Basir, 30, already was in Greece with four children when she learned she was expecting a fifth. Some Greek doctors in Halkida berated her for getting pregnant again and told her the baby would need to be delivered by cesarean section. Their shouts of disapproval stunned her to tears. She had Mohamad, now 5 months old, in Athens. "After I woke up, I looked beside me, nobody was beside me. I did not expect that. I said to myself, 'If I (had) my baby in Syria, it would be better for me. At least my mother would be beside me.' But here, nobody was beside me." Al Basir hopes to be resettled in another European country. "Any country is comfortable for my family and my children," she said. "Anywhere, but not in these tents." 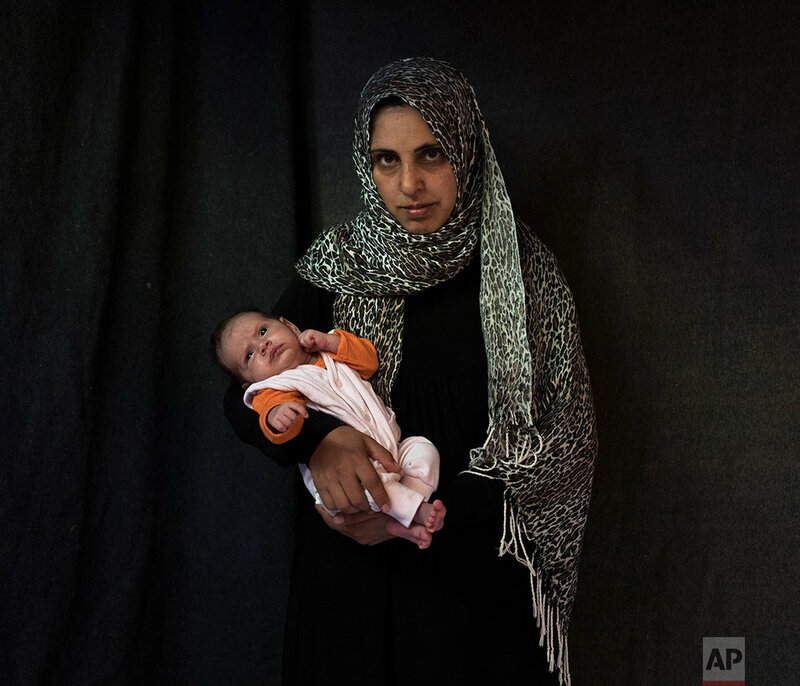 Text from the AP news story, Mothers of newborns in Greek refugee camps cope and hope, by Petros Giannakouris. Theodora Tongas contributed to this story.